My 14 year old daughter likes to cook too. She took it upon herself to make a red white and blue jello flag mold. It had some imperfections, but tasted really yummy. We especially enjoyed the lemon mixed with cool whip layer. You can find the recipe here. We decorated the red stripes with fresh raspberries, but that is the only change we made to the recipe. We will look forward to making it again. Categories: Dessert - Fruit, Desserts, Family Cooks, Kid's can cook! 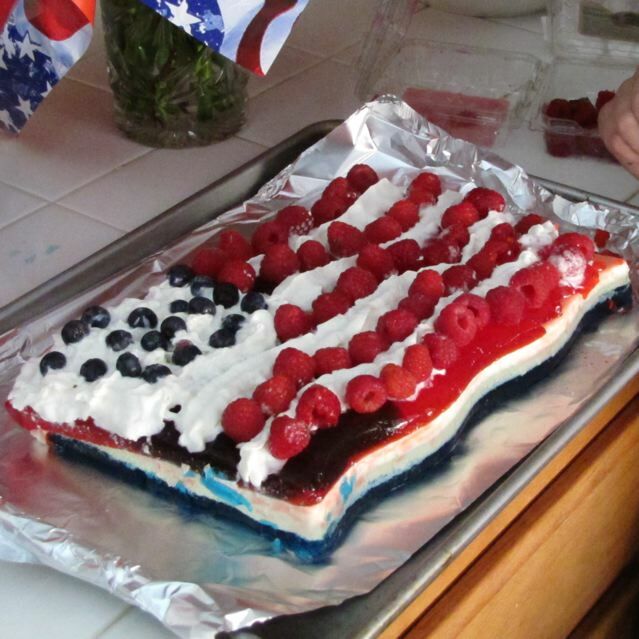 | Tags: All-American Flag Mold, Flag Jello Dessert, Jell-O | Permalink.